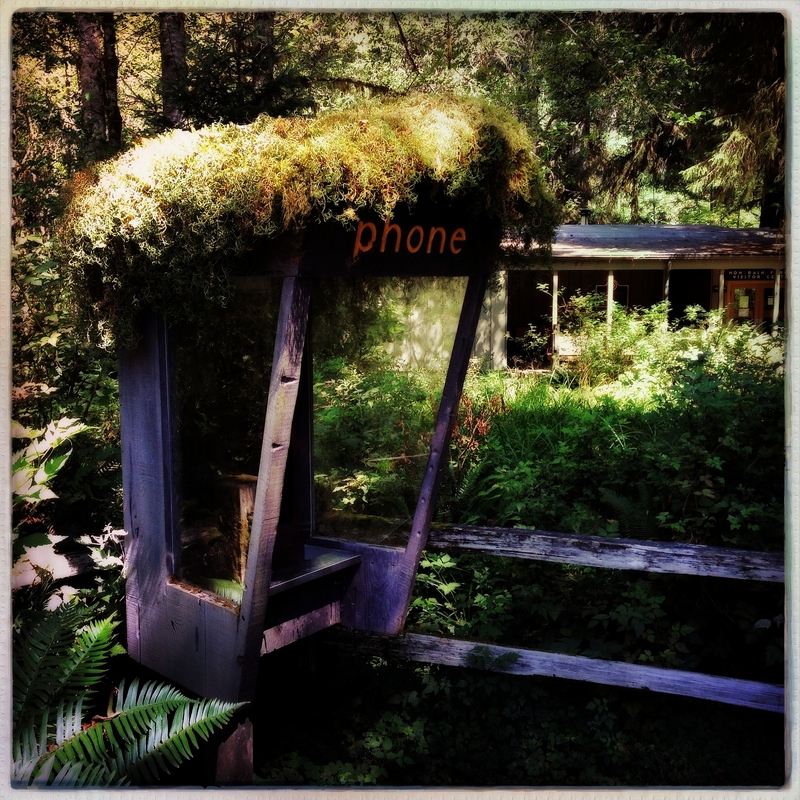 Beautiful, green moss covers most flat surfaces in Washington State’s Hoh Rainforest even this old phone booth outside the Visitors Center at the entrance to the park. Posted as part of Lens and Pen by Sally’s Phoneography and Non-SLR Digital Photo Challenge: Nature. Taken at one of my favorite NW places! It’s a beautiful area, Jane! Yep. That looks about right. Poncho just finished sweeping the roofs here. Next up . . . Moss B Gone. Priceless–and shows how nature wins each and every time. Happy Photo Challenge. The Hoh Rainforest is such an amazing place to visit. I had never seen moss like that before. This is a great photo! Thanks, Andrea! I couldn’t believe it was my first trip here when it’s only a few hours away. We’ll definitely go back next year. It was amazingly green there! Nature is tenacious. It never stops in its efforts to reclaim its territory!! Beautiful spot, Lisa. Love the light you captured. Thanks so much, Amy. The afternoon light through all the green leaves and moss was really wonderful. Love this so much, Lisa! And now I’m inspired to help nature along by putting some moss on top of one of my backyard structures. Oh crap..I’m selling this house. Okay, the next one then! We have interlocking stones surrounding our pool/patio area – and I spend hours clearing the weeds, etc that sprout up in between the pavers, but I just love the moss that sometimes grows there! This is why I giggle anytime I read moss grows on the north side of stuff. Not in WA and for sure not in the Hoh rain forest! I like the contrast between nature and technology/man-made items. Thanks, Janet that is what caught my attention too. I love mosses and lichens. Beautiful colours and shapes, yet so often overlooked. I agree. There are so many variations in the greens as well as their sizes and shapes, it’s fun to get close and really take a look. Fun color and subject. I’ll be sure to bring a quarter when I visit.